Vikings set to go into Battle on the Beach! Newcastle Vikings Handball Club’s women’s team will be competing in the British Beach Handball Championships in Poole, Dorset, next weekend 8th/9th August. Taking place at Branksome Chine beach, beside Canford Cliffs on the scenic Jurassic coast of southern England, the tournament is now in its third year and features its biggest team entry yet with 33 men’s and women’s teams set to take part. The Vikings will be taking part for the first time and have been preparing with some fun practice sessions at Tynemouth Longsands beach over recent weeks. Beach handball, also known as ‘sandball’, is played on a smaller court than standard indoor handball, with 4-a-side teams rather than the normal 7-a-side. Fast-paced and highly entertaining, one of the highlights of the beach version of the game is that goals scored with trick shots, such as shooting while spinning in the air, score double. Goals scored by the ‘rush’ goalkeepers also score double. Points are scored for the winners of each 10-minute half of the match, with ‘golden goals’ deciding each half winner if scores are level and a penalty shoot-out taking place if each team wins a half to determine the overall match winner. Newcastle Vikings ladies, finalists in the English league cup this year and one of 14 women’s teams entered in the competition, appear to have been drawn in a tough group against national league and cup winners London GD’s first team, national cup runners-up Coventry, London-based Olympia and the first team of guest entrants TV Ettlingenweier all the way from Ettlingen in south-western Germany. Their group matches take place on Saturday, with the knock-out rounds then taking place on Sunday. The Vikings are nevertheless looking forward to an enjoyable fun weekend of handball action on the sand. With the flexible team entry rules they will be welcoming back former Vikings player and top goals-per-game scorer from their debut 2013/14 season Nina van Ruijven, who is flying in from the Netherlands especially to play in this tournament. “I’m really excited to join the Vikings ladies again for this tournament, it’s been a long time since I’ve seen them all” she said, adding “I’m most looking forward to be back on the handball court with these lovely girls and beat some teams on the beach!” Also making a guest appearance for Newcastle will be Manchester Handball Club’s Edna Ogbee, sister of Vikings winger Blessing. 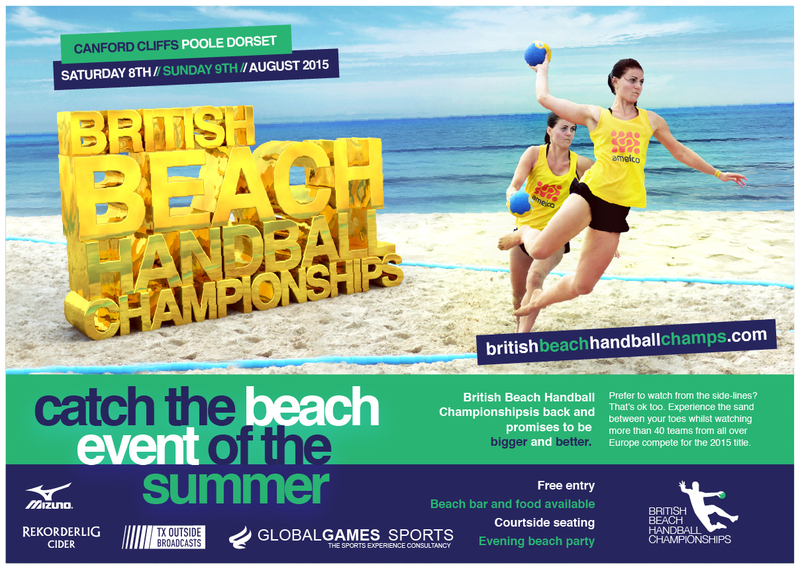 Further details about the tournament can be found at www.britishbeachhandballchamps.com. Anyone interested in joining Newcastle Vikings Handball Club ahead of the new league season can find out more information at www.newcastlehandball.co.uk. Newcastle Vikings beach handball squad: Andrea King (GK), Marlen Slinning (player-coach/GK2), Nina van Ruijven, Gesa Junge, Blessing Ogbee, Edna Ogbee, Kathryn Powell, Sandra Christke (captain/GK2). Previous Post:Vikings First to Achieve National Clubmark Accolade!